Sooooo, if you're planning on throwing a party at your place, you always give everything a good cleaning, right? You sweep the floors, vacuum the rugs, dust the surfaces, exorcise the tortured bathroom spirits, take out the trash, and all that jazz? Of course, we all do. But have you ever run into a pesky presence that just won't quit making a mess right after you've cleaned everything up? We know, that's their job and all, but come on, it's so annoying! 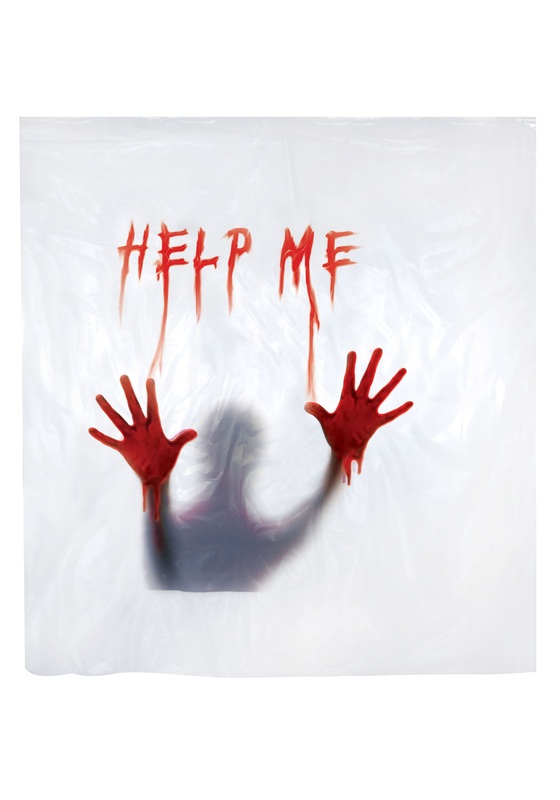 Our advice is to hang this spooky Help Me Shower Curtain up in your lavatory before your shindig begins, and hopefully any ghosts will think they've already done their duty to creep people out in there! Even if you don't have any real poltergeists to scare your guests, this mysterious curtain, with its ominously bloody message and haunting figure printed on it, should take care of that for you when they use your bathroom. Though, you still need to remember to take the trash out on your own.